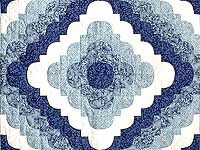 Terrific blue prints make this ocean wave a knockout! 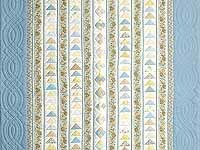 A great crib quilt for that special baby boy, Or a super throw, or a lovely wall hanging (hung sideways over a sofa). Well made by an Amish woman here in Lancaster. Special value!! Dramatic table runner with lovely watercolor style. 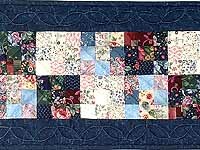 Note attractive navy border print and fine quilting. Will look great on your dining room table on a buffet, or on a wall over a bed or behind a sofa. Made here in Lancaster by an Amish woman. 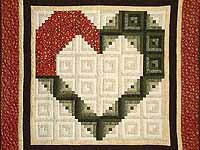 A wonderful quilt to warm someone you hold dear that graphically shows your love! Coloring and soft cotton fabrics specially selected by Hannah. 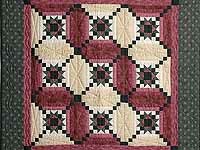 Very well made by one of Hannahs favorite Amish quilters. Note the care taken with the piecing and the fine quilting. Includes a sleeve for a hanging rod. 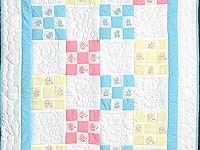 Charming nine patch crib quilt with quilted teddy bears. Lovely quilt for that special baby boy. Made by Amish grandmother here in Lancaster. Note the fine quilting. 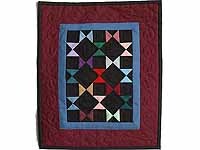 Lovely, out of the 1930s style, quilt with smaller than usual patchwork pieces. 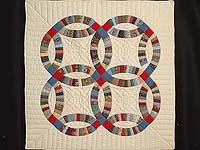 Note the fine extra quilting on the light tan cotton background fabric. Made by an Amish woman here in Lancaster. Wow! 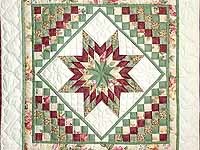 Wahat a sharp patchwork design. 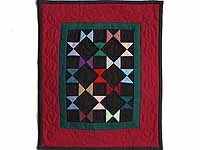 Great fabric selections, precise piecing and nice quilting. Made by an Amish woman here in Lancaster. Includes a sleeve for a hanging rod.